Living like Snow White beyond the seven mountains in a 75 square meters apartment near Alfeld (Leine). 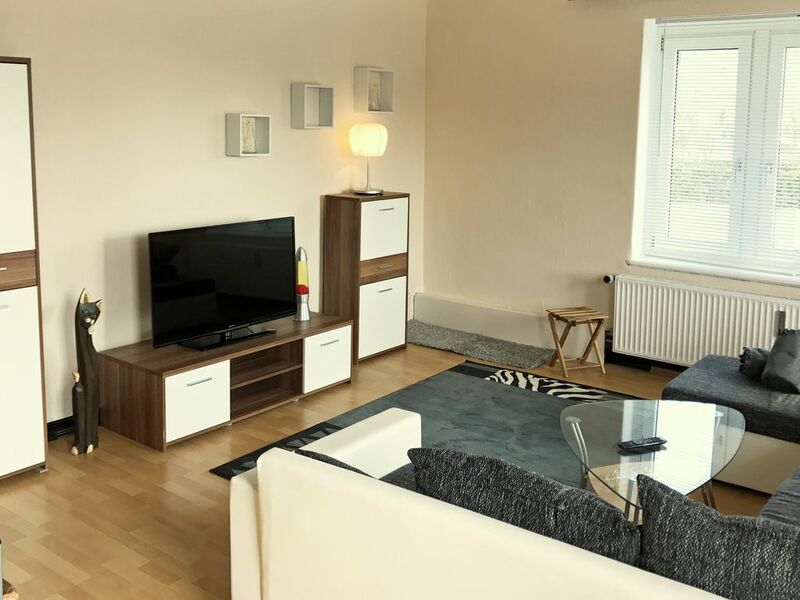 Awaiting you is a two-room apartment with sophisticated equipment, which is ideal for two people, but also can be used alone. When traveling by car private parking is free of charge. In the spacious kitchen can be cooked on a hob will. Pots and pans and a refrigerator with freezer, water and egg cooker, toaster and coffee are available. Here they of pancakes and eggs for breakfast can prepare everything to your liking through to hearty lunch or dinner. Aufgetischt and are eating the delicacies on a large table, which also still takes place in the kitchen and is equipped with two benches. The living room is equipped with multifunctional facilities and can be used for cozy evenings in front of the TV or as an office. The 42-inch flat screen TV is a real eye-catcher and provide in combination with the sofa a cozy lounge to relax. A dining table with four chairs can accommodate a dinner or a cozy coffee break. Multifunctional is the living room by the desk, which offers space for notebook and business records. But here you can also write one or another holiday card at rest or last easily use the desk as a shelf. The land of dreams brings you a box spring in the bedroom. In combination with a 32 inch flat TV can be allowed but also end comfortably in the bedroom the day. Ample space has a wardrobe in that they can just put everything in a longer stay. The bathroom leaves nothing to be desired. It is equipped with a shower and toilet. In addition, various storage space available to toothbrush and other utensils is comfortably accommodate for the duration of their stay. A hair dryer is also on site, so you do not have to worry about missing of storage space in their suitcase. A wall mirror and cozy bath mats complete the picture. More storage space can be found in bright big hall, where even a small sitting area is housed. Furthermore, there is a rack where you can hang your jackets or other clothes comfortable and crease-resistant. Ironing available for this purpose. Last yet found a small chest of drawers provides that space for shoes. Decide on a journey behind the seven mountains of Leinebergland located in Godenau a spot where you can rest and recharge. Enjoy a relaxing stay for one or two, or go to the bustling old town of Alfeld exploring. We are looking forward to your visit. Vielen Dank für den schönen Aufenthalt vom 13.04.2019 - 19.04.2019. Liebe Grüße von Familie Zausch aus Berlin.